Coll. No. 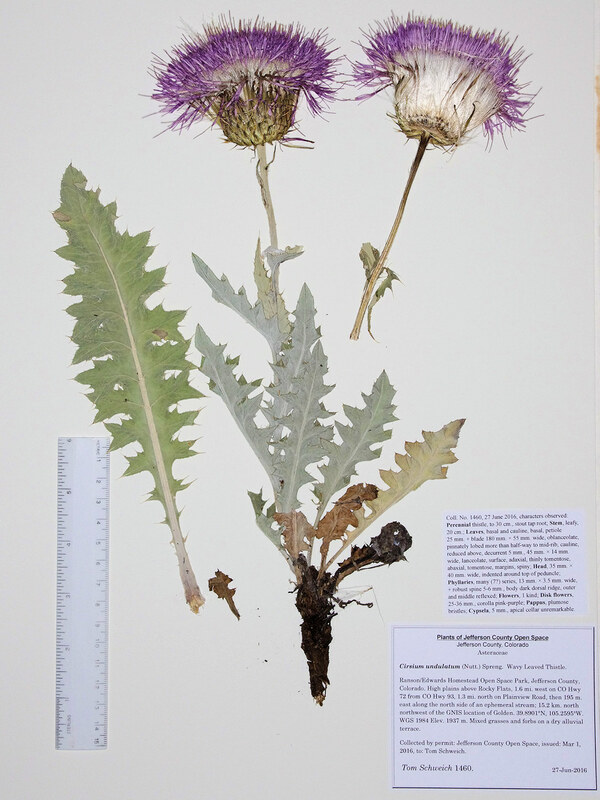 1460, 27 June 2016, characters observed: Perennial thistle, to 30 cm., stout tap root; Stem, leafy, 20 cm. ; Leaves, basal and cauline, basal, petiole 25 mm. + blade 180 mm. × 55 mm. wide, oblanceolate, pinnately lobed more than half-way to mid-rib, cauline, reduced above, decurrent 5 mm., 45 mm. × 14 mm. wide, lanceolate, surface, adaxial, thinly tomentose, abaxial, tomentose, margins, spiny; Head, 35 mm. × 40 mm. wide, indented around top of peduncle; Phyllaries, many (7?) series, 13 mm. × 3.5 mm. wide, + robust spine 5-6 mm., body dark dorsal ridge, outer and middle reflexed; Flowers, 1 kind; Disk flowers, 25-36 mm., corolla pink-purple; Pappus, plumose bristles; Cypsela, 5 mm., apical collar unremarkable. Field Notes: Coll. No. 1460, 27 Jun 2016. Other photos about Species - Asteraceae or Cirsium undulatum.